The ABA mode uses a low sampling rate to provide a view of the signal between triggers while a faster sampling rate is used to show signal components at the trigger with greater time resolution. This method doesn’t use memory as efficiently as the Multiple Recording or Gated modes but it does offer a continuous view of what happens between triggers. Using the time stamp the slow and fast data are synchronized with a resolution of one sample. The re-arm or trigger ‘dead-time’ is reduced extremely in multiple and gated modes compared with single-shot acquisitions. A low trigger re-arm time means you reduce the chance of missing an event even in high event rate applications. Segmentation of the acquisition memory allows more efficient use of memory by recording data at full sample rate only when the signal is active which is indicated by the gate signal. The storage of only significant measurement events without the intervening ‘dead’ time results in less data to be transferred and allows continuous data acquisition and processing of segmented signals. The Timestamp of each trigger event allows you to read the time difference between event. When the events represent abnormalities in the signal, timestamps provide information on the rate of occurrence of the anomalies. Timestamps can by synchronized to an external reference signals such as a radio clock or IRIG-B timing generator to get UTC synchronized timestamp information on every event. The slow A-data gives you an insight in between the acquired data segments without generating a heavy data transfer load like it would occur when using FIFO (streaming) mode. If the data between the acquired segments had some importance then the ABA mode should be employed as shown in Figure 4. In this mode the data is recorded using two different sampling rates. The ABA mode generates two data channels from each input. The primary data channel, called the ‘B’ channel, contains a Multiple Recording acquisition with one segment of data for each trigger that was detected. 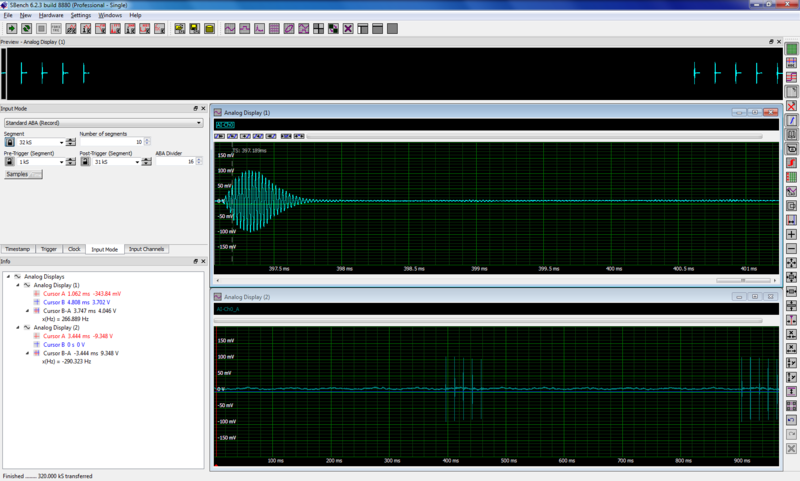 The B data acquisition is running with the selected sampling rate. The second data channel (called ‘A’ data) runs continuously with a divided sampling clock and acquires a slower continuous signal. The time synchronization between A and B data is based on the acquired timestamps. The resulting display has a full acquisition over the complete run time with the slow A sampling clock while at each trigger event a B segment is generated, sampled at a higher rate, and providing more information on the area of interest. The upper trace in the right hand figure is the preview which shows the entire acquisition. The center display is a single segment of data recorded at the selected sample rate (B sampling clock). The time stamp shows the trigger time. The bottom trace is the continuous ‘A’ data sampled at one sixteenth the selected sample rate. Note the continuous record shows information between pulses that is not evident where Multiple Recording mode only is used. Products based on the MICX platform do not support the ABA data acquisition mode.